The Colorado Trail Foundation likes to claim their trail as the most beautiful of the 11 National Scenic Trails. 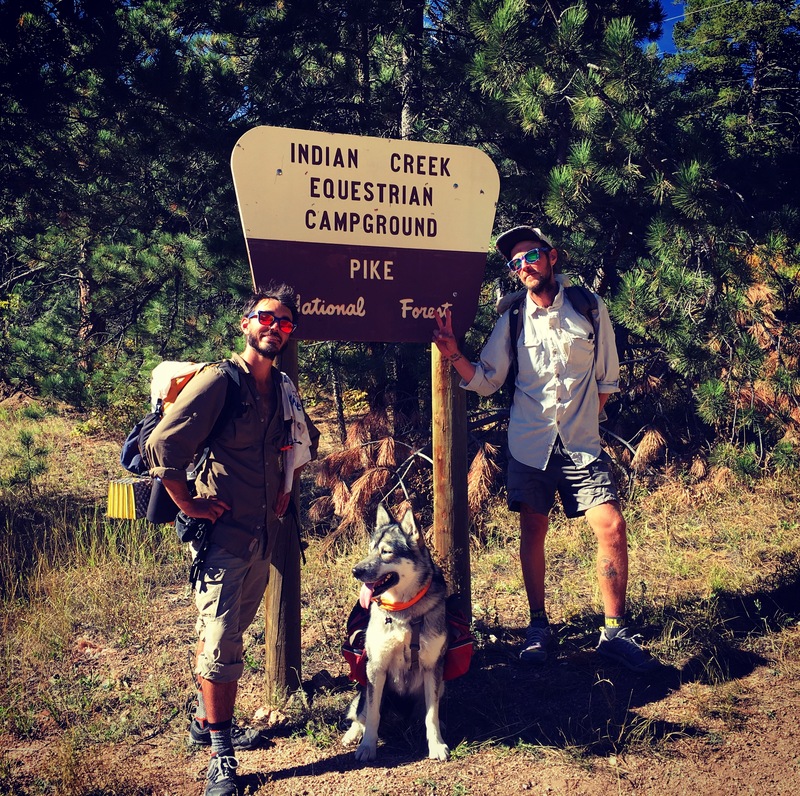 It’s hard to argue with them… You’ll find expansive pine forest, massive aspen groves on fire with fall color, beautiful trail towns full of friendly locals and delicious local beer, exquisitely maintained trail and miles & miles of views. Of course, it is the high Rockies, so you may also encounter thunderstorms, snow at any time, subarctic temperatures, and looooong exposed miles of trail. But like many adventures, the risk often heightens the reward. New vegan trail snack by Harpo-mane – freeze dried strawberries with Dang original toasted coconut chips. Tasty! We shared planning duties for the hike, tho to be honest logistics were pretty easy compared to some other hikes Harpo & I have done. There was some spread sheets covering mail drops, mileage, and shared gear – but not too much nerding out. Our resupply strategy was partial mail drops supplemented with whatever we could find in town. U could easily resupply 90% in town, no problem, and mail yourself a few boxes if you wanted to avoid longer hitches. Harpo and I had a bunch of homemade dehydrated meals left after leaving the CDT early in 2016, so Atrain and I chose to use as many of those as possible hence more boxes. Thankfully Harpo was willing to mail our resupply – being busy with the full time job thing – and hooked up the super surprise vegan snacks too! Surprisingly wild flowers were everywhere – even in late September, probably the result of abundant summer rains. From the first step to the last, the CT is meticulously maintained. Many sections rival Yosemite, not just in beauty, but in the sheer attention and time trail crews have invested in creating an exceptional trail experience. Wayfinding was easy as signs were well placed both NOBO & SOBO, and there was nary a blowdown to be found. Given, we hiked the trail at the end of the season (September 3 – October 5) so crews had all summer to clean it up, and we didn’t really deal with extensive snow. One difference from the AT & PCT tho; be ready for mountain bikers. I also love a good shred, so it didn’t bum me out – tho there was a good couple of hours one day dodging dudes on a tour with poor trail etiquette, and a Saturday when we ran into and annual charity ride (and literally hundreds of bikes). On the whole everyone who shreds there seems to know the deal, is super polite and happy to share the trail. In September we dodged the majority of the monsoon season, so we only had to hide in a ditch dodging lighting once. Score! Reports from SOBO hikers indicated that was not their experience. And we did catch a little early season snow coming out of Brekenridge – about 3 feet up top, which was enough to provide 5 hours of shin shredding post holing up Georgia Pass. Ekho, who is mostly husky, was LOVING it – especially after the sun set and the full moon started making monsters in the shadows. I will say – it was not summer up there. The trail elevation averages 10,300 feet, with a high point of 13,271 and many passes over 12,000. NBD but prepare yourself appropriately, especially if hiking thru the monsoon season in August when u might wind up wet & cold everyday. We definitely got wet on several occasions, and our weather experience was mild compared to many SOBO reports. Campsites were easy to find, often had spectacular views, and because of the plentiful summer rain many campfires were had. It’s impossible to pick one when they’re all so awesome! Most had great resupply option, many had hostels, and people were totally down for the cause. In particular we had a great time in Silverton (great hostel, brewery & pizza), Lake City (long hitch but excellent hostel & full grocery), Salida (another long hitch, heard the hostel was good but stayed in a cheap hotel, great river swimming, good natural foods store), and especially Leadville (excellent hostel, short hitch, friendliest locals, brewery, grocery). Brekenridge was a little bobo for my taste. Twin Lakes would have been hard for a vegan to full resupply (we got a package) but the restaurant had an awesome black bean burger. Epic views every day – and impressive variety of terrain. Just when you’re feeling too stressed about a long but beautiful exposed section, you’ll duck into some lush pine forest & find some of the coldest, clearest mountain streams ever. I loved this trail. I want to go back and snowshoe it right now, then mountain bike it in the summer. I liked it so much I somehow convinced Harpo it would be a great idea to move to Leadville – and that’s where you’ll find us now. I think it’s logistically simple enough to make a great first thru, but rigorous and beautiful enough to challenge and amaze even saltiest dirtbag. So go forth & HIKE!!! This entry was posted in wrong way gang and tagged America, backpacking, colorado, coloradotrail, continentaldivide, hiking, thru-hike, thruhike, vegan, veganhiker, wrongwaygang on January 27, 2018 by GROUCHO.